Welcome to the August 2018 Microsoft® Excel Tip of the Month! If you like to use multi-line headings in Excel, you'll love this month's tip! Just ready below. 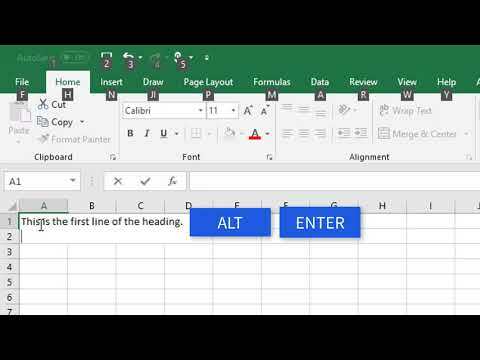 If you've used Excel for awhile, you know that when you are working in a cell and hit the ENTER key on your keyboard, the cursor goes to the next cell. For data, this is usually pretty convenient. However, when you're creating column headings and you'd like to add an additional line, you haven't been able to do that just by hitting the ENTER key. Instead, just hit ALT + ENTER and your cursor goes to the next line! You may need to adjust some formatting but this tip works! If you're using Excel for Mac, the trick still works- you just use the keyboard combination of Control-Option-Return. This is an easy shortcut that can save you time and frustration! To see how this is done in the Windows version of Excel, just click the video below!